Excavators from Israel have announced the discovery of three millennia-old pagan ritual evidence, which supports the hypothesis of pagan worship at Tel Burna back then. Experts suggest that the new finds could shed light on Tel Burna and Canaanite ritual practices. Israeli and international archaeologists have been trying for many years to spot a cultic site presenting ritual practices. Now Haaretz has recently reported , that researchers conducting excavation works at Tel Burna have discovered several masks and more cultic vessels that makes them sanguine that Canaanite ritual festivities took place 3,200 years ago at Libnah, a Canaanite city in the Kingdom of Judah listed among the 13 Kohanic cities (Joshua 21:13). The excavations works in the city were launched eight years ago (2009), when Dr. Itzhaq Shai of Ariel University and his team spotted a quadrangle inside a sturdy building, nearly 16 meters (52.4 ft) long, constructed directly upon substratum. Back then, archaeologists couldn’t be certain about the purpose of the building, but after unearthing several objects emanating signs of pagan cultic activity, they will now postulate the building’s use with more certainty. The objects include a massebah (a pillar made of stone, associated with worship or memorial activity) depicting a deity or a cultic object, cultic vessels such as goblets and chalices, figurines, zoomorphic vessels, and two ceramic masks. “The fact that we have a massebah and a concentration of cultic vessels clearly indicates that the activity within this courtyard was not daily life, but ritual practice," Dr. Shai told Haaretz . According to Dr. Shai, the new finds bolster his theories, as he had previously suggested that “not every ancient site sporting a war god or female figurine is a temple to Baal or Anat," as Haaretz reports . 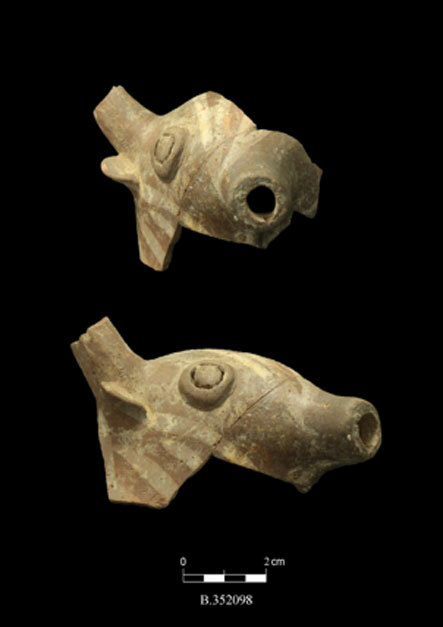 Interestingly, among the fascinating new finds uncovered this year were included three unique, small vessels of Greek-Cypriot origin. The meticulous examination that followed, showed that each vessel had contained a different kind of oil and they were most likely used for ritual purposes. Furthermore, two immense pithoi imported from Cyprus, each with a capacity of 200 liters, were found along with charred bones of young sheep, goats and pigs. 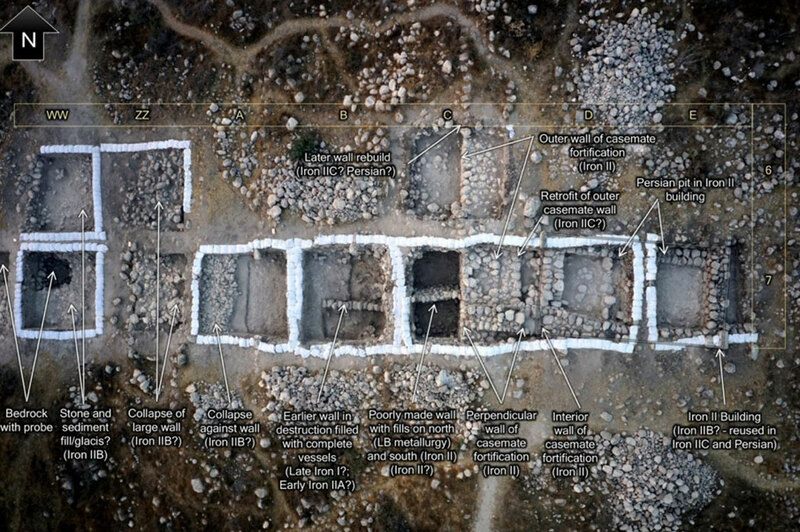 “The presence of imported giant pithoi in and of itself is indicative that Libnah was an important site of worship to the Canaanites in the 13th century BC,” Dr. Shai tells Haaretz . "Since the pithoi were discovered in the same context as the cultic vessels, we assume these were also part of this activity," he concludes. Dr. Shai also suggests that the large cups and cultic vessels possibly imply the use of scent and aromatic equipment, while he appears to be more confident about the votive vessels and figurines being clearer indications of pagan worship involving offerings. “The masks could indicate the starting or ending point (or both) of religious processions, or the presentation of a religious icon, such as a deity,” Dr. Shai also proposes. Additionally, Professor Philipp Stockhammer of the Ludwig-Maximilians-University of Munich views the new finds as a great opportunity (for the archaeologists and historians) to study and understand better the Canaanite rituals, but he advises everyone to be cautious, as it might not be easy to interpret the Burna evidence. “Most of the vessels were found directly on the bedrock, and it is difficult to interpret their relation to the nearby walls. All that I can say at the moment is that Burna seems to have a unique concentration of foreign-related objects used together in the framework of hardly understood offering/ritual practices, and we definitely need to continue the fieldwork there in order to better understand the evidence in Burna and Canaanite ritual practices more general,” Stockhammer told Haaretz , clearly stating that there’s much more work to be done. So this was before Moses?